Once every few years, a game-changing pass-rusher hits the market and inspires his team to hit new defensive heights. Reggie White. Kevin Greene. Julius Peppers. Mario Williams is the next player in that group of legendary acquisitions, a one-man wrecking crew who carried a dormant Texans unit on his back for five seasons. And while those players were acquired after they had passed their athletic primes, Williams just turned 27 in January; he’s about to hit his athletic peak. As the most well-rounded and versatile lineman in this year’s class, Mario Williams is the sort of player that can make a bad defense good, a good defense great, and a great defense legendary. His combination of proven performance, elite athleticism, and room to grow with age makes him the most valuable defensive player to ever hit unrestricted free agency. Mario Williams creates havoc in the offensive backfield to an extent that only the best defenders in football can match. Unfortunately, because he hasn’t had the players around him to complement that rare pass rushing ability, his performances haven’t received the sort of notoriety that more prominent players have gotten. The Texans finally put together a secondary to take advantage of Williams’ rushing ability in 2011, but after five sacks in five games, Williams suffered his only major injury as a pro, a torn pectoral muscle that sidelined him for the remainder of the season. If we put Williams’ performance in context by accounting for that season and the players around him, a masterful pass-rusher is revealed. What’s first impressive about Williams is how successful he has been without the presence of a second significant pass-rusher to play alongside him. Other pass-rushers who have hit free agency in recent years have had dynamic rushers on the other side of the field to take the heat away. Ray Edwards had Jared Allen, and Allen had Tamba Hali. Robert Mathis had Dwight Freeney. There was not a player of any note to operate across from Williams before 2011, and teams keyed on that fact by doubling Williams on virtually every single play. 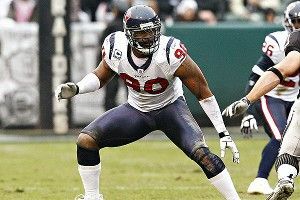 Williams was the only Texans player during that five-year stretch to produce six or more sacks in a season, something he did in four consecutive years. Other teams knew that he was coming and that he was the only person they really needed to worry about, and they still couldn’t stop him. That says a lot about Williams’ ability to be “the man” on a defense, the guy to whom the unit turns when they need a big play. What’s even more incredible is that Williams was doing all this at a remarkably young age. For a 25-year-old to average nearly 10 sacks per season over a five-year stretch is nearly unprecedented. In fact, since the NFL started tracking sacks in 1983, only two players have accrued more sacks by the time they turned 26 than Mario Williams: Derrick Thomas and Dwight Freeney. If you want to give Williams credit for that sack-per-game pace and suggest that he would have finished a fully healthy 2011 season with 16 sacks, that would give him a total of 64 sacks through the completion of his age-26 season. The only player with more sacks than that through 26 would be Thomas, and even he would only be two ahead of Williams. Let’s include that 2011 season in the analysis, because once you account for the lost time, Williams’ production just becomes all that much more impressive. Over the past five years, Mario Williams has sacked opposing quarterbacks 48.5 times in just 66 games. That’s an average of 0.73 sacks per game, or just under 12 sacks per full season. It’s a figure that’s also only been topped by two players. 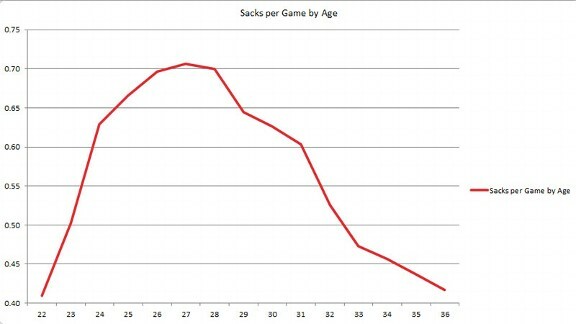 Based on how those sack artists performed historically, they peaked at age 27 by sacking quarterbacks 0.71 times per game. Remember from the previous table that Williams has been sacking opposing quarterbacks at a slightly higher rate — 0.73 times per game — over the past five seasons, when he was 22-26. These dominant pass-rushers put up a roughly similar performance at ages 26 and 28 before beginning to decline thereafter. The real dropoff comes at age 32, when the top 50 pass-rushers average 0.53 sacks per game and never again approach an average above that half-sack-per-game figure. You’ll note that the market’s two other prominent defensive ends are 31-year-old Robert Mathis and 33-year-old John Abraham. Each of those players have likely already played his best football. Your team can lock up Mario Williams on a five-year deal and actually see him play out the entire contract before he can be expected to suffer any sort of serious decline. Mario Williams can do a lot of things. He can play as a defensive end in a 4-3. He can move to outside linebacker in a 3-4. He can play the run effectively. He can bounce to either side of the line. What your organization is going to pay Mario Williams to do, though, is rush the passer and create big plays for your defense. And when you put the numbers in their proper context, the only player in football who compares to Mario Williams as a young pass-rusher forced to go it alone is DeMarcus Ware. Other teams will get a veteran and hope that he hasn’t lost it. Only one will get the sure thing, a superstar in the prime of his career. To be quite honest, Mario Williams shouldn’t be a free agent. The Houston Texans failing to negotiate a contract extension with Williams before his deal expired will go down as one of the great mistakes in league history, like the Eagles failing to lock up Reggie White, or the Falcons letting Deion Sanders go. Their inability to lock up Williams with the franchise tag is going to be a franchise-defining moment for two teams: the Texans and whatever team is lucky enough to add the most valuable defender in the history of free agency to their roster.